This retro Winnie Drop 1710 teardrop trailer by Winnebago Towables is super light and ready to go! Featuring a front booth dinette with a slide-n-seat for seating, dining, and even added sleeping space with the table folded down, plus more! This unit also features a rear queen bed with underbed storage, plus complete kitchen and bath amenities to make traveling fun! There is a wet bath with shower and toilet along the curb side, just around the corner from the door. You can easily cook up light meals and snacks in this Winnie Drop with a refrigerator and microwave oven, a two burner cook-top, and single bowl sink. There is also overhead cabinetry for your daily dishes and things. Just inside the entry door on your left you will find a TV mount where you can add an optional flat screen TV to enjoy on those rainy days inside. Parkview RV Supercenter is a Delaware RV Dealer that offers both New RVs and Used RVs in Smyrna, Delaware, including some of the top manufacturers in the industry like: Winnebago RV, Keystone RV, KZ RV, Lance RV, and More. As an RV Dealer in Delaware we are with our customers for life, whether you buy from us or not, we provide everyone with full RV Service and RV Parts departments to help keep your RV looking and running like new. For those looking for an RV and are unsure if you can afford one please stop into our RV Financing department. Our Financing staff is not only here to help make your dream of owning an RV a reality, but also to establish for you the lowest monthly payment to help keep you within your budget. 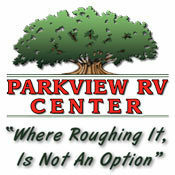 At Parkview RV we take great pride in our customers, and are willing to do what it takes to make your RV dreams come true. After all, we haven't been in business this long by simply selling RVs , but because we make sure our customers are treated like family.. If you need help finding an RV please Contact Us, we'll make sure to get you and your family in the right RV!